Round 2 is in the books, and as much as No. 3 Virginia (20-2, 8-2) wanted to defend the lane against No. 2 Duke Saturday at John Paul Jones Arena, the Blue Devils’ hot perimeter shooting was the story in an 81-71 win, snapping the Cavaliers’ 13-game home winning streak. Duke (21-2, 9-1) shot 58 percent (26 of 45) for the game — the highest clip by a Virginia opponent since the Maui Invitational loss to Washington in 2010 — and a whopping 62 percent (13 for 21) from deep, despite coming into the game ranked 317th in the country in 3-point shooting percentage at an average of 31 percent. The Devils outscored Virginia 17-0 on fast-break points as the Wahoos had yet another double-digit turnover performance, their third in a row, and Duke made them pay on the other end. Duke came out firing to start the game, most notably from long range. The Blue Devils knocked down their first five triples — and 7 of their first 8 — and led by as many as 14 in the first half before the Cavaliers mounted an 11-3 run over the final 2½ minutes to avoid a potential blowout. Ty Jerome, who was back in the starting lineup, sank a 3 with 4:25 left in the half that got the ‘Hoos back within single digits and got the sellout crowd back in it. “Obviously when they hit five in a row and seven out of eight, it is hard because it is an uphill battle all game and I think that we just need to do what we do best and we will do better throughout the year,” said Virginia junior guard Kyle Guy. After a Jerome runner in the lane, Guy and Kihei Clark nailed back-to-back 3s, and then Guy used a stepback to clear space and let another one fly to make it a two-possession affair with a minute left until halftime. After a defensive stop, Guy finished the half with a strong drive to the hole with 33 seconds to go and UVA carried the momentum into the break, trailing by just four, 39-35. The Devils made 8 of their 11 trifectas in the first half. RJ Barrett made 5 of his 7 from long distance in the first half alone. NBA Superstar LeBron James of the Los Angeles Lakers was in attendance at JPJ (alongside Laker teammate Rajon Rondo), sitting behind the basket in front of the Cavalier student section and band. He was introduced on ‘HooVision for one of the loudest ovations of the contest during a timeout in the first half. Duke’s Cam Reddish caught fire to start the second half, sinking three 3-pointers by the first media break, and all of a sudden the Duke lead was back to 11, 52-41, with 15:45 to play. Down by 10, UVA got a spark from sophomore forward Jay Huff, who blocked a shot on one end and then buried a 3 from the top of the key. After a Zion Williamson turnover on the ensuing trip, Huff lasered a pass into Braxton Key for an easy bucket at the rim, and the Duke lead was trimmed to 54-49 with still over 12 minutes remaining. Duke freshman point guard Tre Jones, who missed the first meeting in Durham, scored 7 straight points for the Blue Devils over the following 2½ minutes, and another Barrett 3-pointer pushed the advantage back to 10, 66-56, with 7:21 to go. 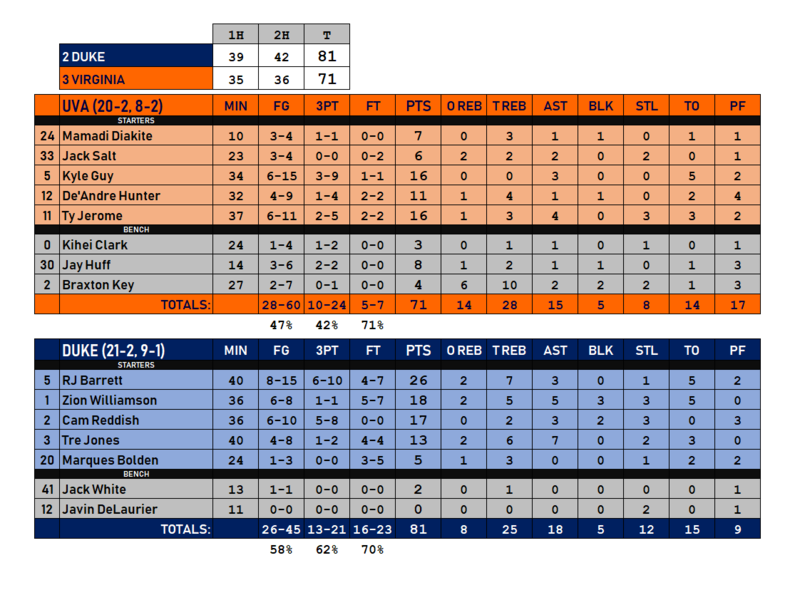 The ‘Hoos continued to fight back, as De’Andre Hunter made his only 3 of the game with 5:25 left to get back within five, but Duke outscored UVA 15-8 for the duration of the contest to record the regular-season sweep. Barrett, who sank 6 long balls on the night, led all scorers with 26 points and a team-high 7 rebounds. Williamson scored 18 on 6-of-8 shooting to go with his 5 boards, 3 steals and 3 blocks. Reddish finished with 17 points (with 5 3-pointers of his own), 3 steals and 2 blocks, and Jones added 13 points, 6 rebounds and 7 assists. Guy and Jerome each scored 16 to pace the Wahoos, who shot 47 percent for the game and 42 percent from 3-point range and hauled down 28 rebounds compared to 25 for the visitors. Hunter added 11 points, while Huff finished with 8 off the bench in 14 minutes. Mamadi Diakite — who scored 7 of the first 9 points for the ‘Hoos to start the contest — left the game at the 4:39 mark of the first half after appearing to bump heads with Hunter in front of the Duke bench and did not return. Key chipped in with 4 points and a game-high 10 rebounds — 6 of them on the offensive glass — to go with a pair of blocks and two steals. Virginia will not have much time to get ready for a 7:00 tip at No. 8 North Carolina Monday night. The Tar Heels held off last-place Miami, 88-85, in overtime Saturday afternoon.